A funeral sermon is a talk on a religious or moral subject, especially given during a funeral service and based on a passage from the Bible. 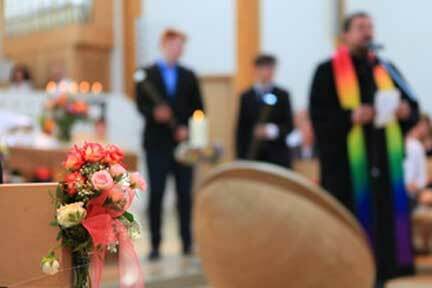 Faith based funeral services generally are officiated by a Pastor, Priest or clergy of the church. There is a time slotted into the order of service for a sermon especially for the bereaved family members and attendees to provide encouragement and hope during a time of loss. They are faith based in nature but can also be secular depending on the denomination of the deceased. Often the Pastor gives a sermon relating to the deceased in some way, shape or fashion. Sometimes it can be based on how they died. It is often tailored so that it personalizes the service and the surviving family members are provided some peace of the loss. It can be of great comfort to mourners because it helps make some sense of it all based on a higher power. Funeral sermons are typically not as long as a church sermon and are generally about 15-25 minutes in length. This can vary according to the religion or church affiliation. The sermon brings out several Bible verses that relate on the topic being given. The Pastor or clergy may provide some personal references to the deceased by relating to things they have said or did in life. This is essential to include because it helps the message to be relatable to those lives they touched and who the deceased knew. The sermon can be given if the funeral service is held in a church, funeral home or other location. It typically is placed in the middle of the funeral ceremony and allotted a good amount of time for the message. It can be also referred to as a message of hope or a message of encouragement. Sometimes, families like to change the title on the funeral program because sermon can have a negative connotation for those in attendance who are not believers or within the faith. For Catholics, the funeral sermon is called a homily. Every funeral service does not have to have a sermon being said but often if the deceased was part of a church, it is provided to the family should the ceremony be religious in nature. Although the family or deceased may have been religious, some attendees may not be. Because the focus of the message is providing comfort to the immediate family, care must be taken if they are not of the faith. The sermon should incorporate the deceased into the topic of the message by saying his or her name during the message and including personal experiences of them, if possible. It can also provide passages about heaven and life after death, speaking of no more pain and sorrow. Some Christian affiliations title the funeral service A Celebration of Life because it is more uplifting than it is somber and focuses on their loved one being in a better place - heaven. This does bring much solace, comfort or consolation in a time of distress or sadness for the grieving heart. The funeral sermon is generally the main message given in a service and is the lengthiest item in the order of service. We have provided some samples below for funeral sermons in specific situations as an example and reference to gain insight on how it can be presented and how the scriptures and Bible lesson is integrated nicely together.